Windows 8 will inevitably make a mistake when you’re handwriting on your tablet. It won’t recognize one of your words correctly, for example, or it will turn an inadvertent keystroke into a period. To correct mistakes in the handwriting panel before you’ve touched the Insert button, draw a line through the misspelled word or letters. Spot a mistake in text that’s already entered? Then run your stylus over the text that needs correcting, just as though you were highlighting it with a marker. As you highlight the text, it appears in the handwriting panel, as though you’d just written it by hand. Once the text appears in the handwriting panel, draw a line through the words you’d like to remove, just as though you’d written them there. Then tap the Insert key to put the corrected version back in place. 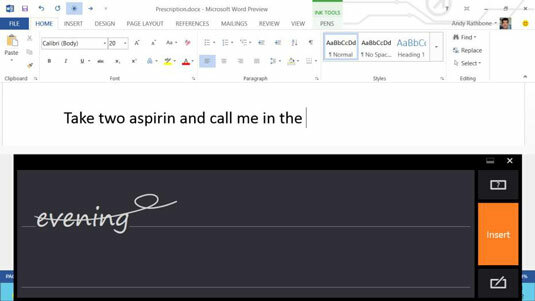 To correct a single letter within a word in the handwriting panel, tap the word. Windows spaces the word out, letter by letter. Write the correct letter over the incorrect letter, and Windows replaces the wrong letter with the newly corrected letter. To add a symbol, tap in your document where the symbol should appear. When the handwriting panel appears, you’ll see a symbol key. Tap it to see the available symbols, and tap the one you’d like to place into the document. For more tips on how to correct items in the handwriting panel, tap the question mark icon in the handwriting panel’s upper-right corner. Detailed animations show exactly how to correct, delete, split, and join letters and words.